Wine and Champagne. 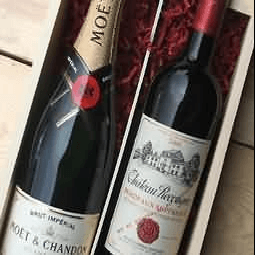 1 bottle of Wine Chateau Pognain Bordeaux red and 1 bottle of Moet Chandon Champagne. A two bottle gift pack. 1 bottle of Moet Chandon brut Pale yellow with shades of green. The aroma is delicately vinuous with a lime and vine blossom attack and 1 bottle of Chateau Pougan is a historical Bordeaux estate with more than 400 years of experience.